354 Beacon is located on north side of Beacon, between Fairfield and Gloucester, with 352 Beacon to the east and 360-370 Beacon to the west. 354 Beacon was built in 1883-1884 for wire and cable manufacturer Charles Anthony Morss for speculative sale, one of two contiguous houses (354-356 Beacon), both with bow-shaped bays on the east side. Charles Morss and his wife, Mary Elizabeth (Wells) Morss, lived at 323 Marlborough. Charles Morss purchased the land for 354-356 Beacon on April 21, 1883, from Stephen D. Bennett. It was the western 48 feet of a 73 foot wide parcel originally purchased from the Boston and Roxbury Mill Corporation on January 24, 1881, by Frances E. Parker, and sold by him on February 12, 1881, to Arthur W. Blake. Arthur Blake sold the eastern 25 feet to Charles Walter Amory and the western 48 feet to Stephen Bennett. Click here for an index to the deeds for 354 Beacon. 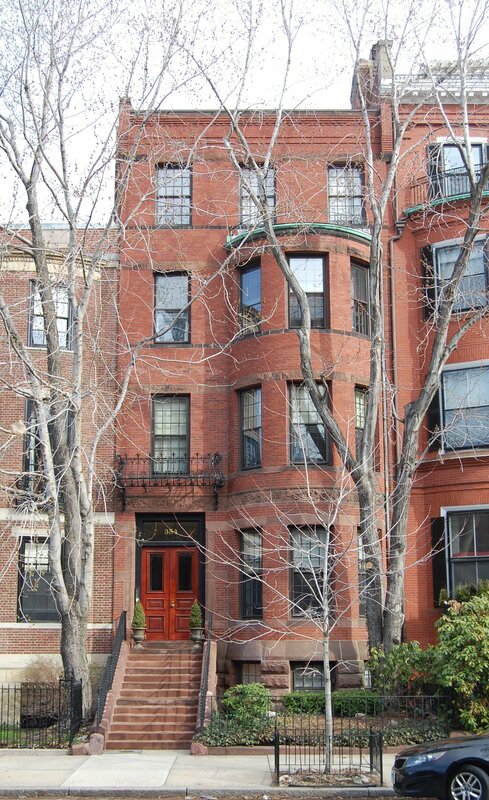 It appears likely that 354-356 Beacon were built for Charles Morss by building contractor Samuel Tarbell Ames, who is shown as the owner of 356 Beacon (shown as 382 Beacon) in the Boston Public Library’s index to the final building inspection reports (the actual report for the house is no longer extant). In his Houses of Boston’s Back Bay, Bainbridge Bunting states that Samuel T. Ames built 356 and 386 Beacon (next door) ca. 1883. This is incorrect, inasmuch as 386 Beacon was built ca. 1872 by John Farrington. On March 27, 1885, 354 Beacon was purchased from Charles Morss by attorney William Warren Vaughan, He and his wife, Ellen Twisleton (Parkman) Vaughan, made it their home. They previously had lived at 3 Brimmer. They also maintained a home in North East Harbor, Maine. During the 1899-1900 winter season, the Vaughans were living elsewhere and 354 Beacon was the home of Robert Swain Peabody and his wife, Annie (Putnam) Peabody. They also maintained a home in Marblehead. He was an architect; his firm, Peabody and Stearns, was one of the foremost architectural firms in Boston and designed a number of homes in the Back Bay. 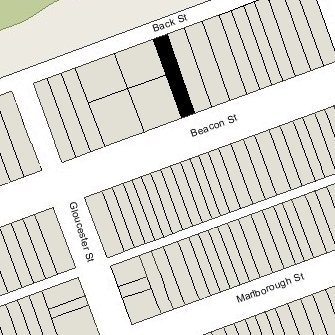 Earlier in 1899 they had lived with Annie Peabody’s sister, Ellen Putnam, at 355 Marlborough. The Peabodys had moved from by 1901 and were living at 22 Fenway by 1902, and 354 Beacon was once again the Vaughans’ home. Ellen Vaughan died in August of 1934. William Vaughan continued to live at 354 Beacon until about 1935. He had moved to Hallowell, Maine, by 1937. In 1936, 354 Beacon became the home of Frederick Allen Marsden, a retired physician, who operated it as a lodging house. Earlier that year, he had lived at 22 Marlborough. He had moved to 290 Marlborough by mid-1937. On January 13, 1937, the Boston Globe reported that William Vaughan had sold 354 Beacon to Fred A. Kilgore, who (the article stated) had purchased the property with the intention of converting it into apartments. The sale was never finalized. On April 29, 1937, 354 Beacon was acquired from William Vaughan by Sylvia (Levy) Sundland, the former wife of Dore Sundland. She lived in Brighton. That same month, she filed for (and subsequently received) permission to convert the property from a single-family dwelling into ten apartments. She also was the owner of 371 Beacon, across the street, which she also converted into apartments in 1937. Both remodeling projects were designed by architect Herman L. Feer. On May 3, 1937, 354 Beacon was acquired from Sylvia Sundland by real estate dealer Bernard Brooker, and in June of 1937, he also acquired 371 Beacon from her. Both deeds were not recorded until February 10, 1939, and she was the assessed owner of both properties in 1938 and 1939. On the same day, he recorded deeds transferring both properties to The Chestnut-Beacon Realty Co.
On April 29, 1941, Julius Krinsky foreclosed on his mortgage to Sylvia Sundland, which had been assumed by subsequent owners, and took possession of 354 Beacon, transferring it to 354 Beacon Street, inc., the treasurer of which was his son, attorney David Krinsky. In June of 1941, he foreclosed his mortgage on 371 Beacon and also transferred it to 354 Beacon Street, Inc. It owned both properties for the next twenty years. David Krinsky died in September of 1960 and his wife, Ruth (Abramson) Krinsky succeeded him as treasurer of 354 Beacon Street, Inc.
On August 1, 1961, 354 Beacon and 371 Beacon were acquired from 354 Beacon Street, Inc., by Lester Robinson of Lowell, and on April 9, 1964, he transferred both properties to his daughter, Louise Edith Robinson, as trustee of the Louise Robinson Realty Trust. On June 14, 1965, 354 Beacon was acquired from Louise Robinson by Murray Goldshine and Carl A. Gordon, trustees of the 354 Beacon Street Realty Trust.. The property changed hands and on May 2, 1969, was acquired by Harry A. Cohen, trustee of the Marco Realty Trust. On December 28, 1976, the Marco Realty Trust was merged into the Marco Realty Corporation, of which Harry Cohen was president and his son, Kenneth W. Cohen, was treasurer. On June 26, 1979, Marco Realty transferred the property to the Commonwealth Group, Inc., of which Harry Cohen’s son, Richard D. Cohen, was president and treasurer. 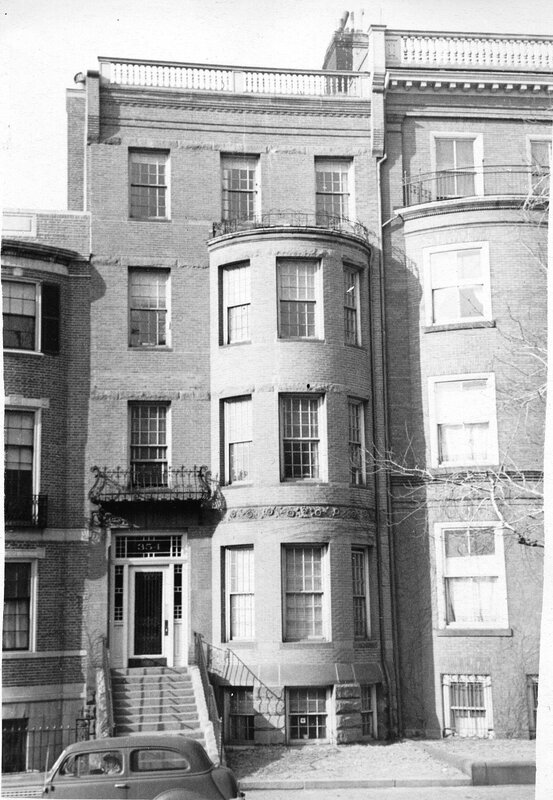 On July 14, 1980, the Commonwealth Group converted the property into ten condominium units, the 354 Beacon Street Condominium.